Buffet Height 72", Width 46 1/2", Depth 22". A very rare Arts and Crafts walnut bookcase by Shapland and Petter. In Walnut retaining its original finish. The daffodils resonating with vivid colours throughout with remarkably no colour loss. The daffodil inlays were originally designed by M. H. Baillie Scott for furniture made by J .P. Whyte at The Pyghtle Works in Bedford. There are a number of Baillie Scott designs used by Shapland and Petter yet no association is known. Height 32”, Length 20”, Depth, 7”. 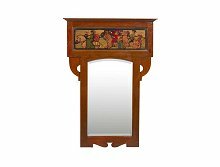 A Shapland and Petter Arts and Crafts oak hallstand with a flaring cornice that has a subtle moulded detail to the lower part and a bevelled 'A' frame mirror set back behind angular 'A' frame details with an open area below. A central bow fronted drawer flanked by open cubby holes with a stunning stylised floral copper panel to the lower section and conforming copper panels to the upper sides with wonderful stylised copper coat hooks and drawer handle, the central lower section with stylised floral cut-outs to where the umbrella and walking sticks sit. Height 82 1/2", Width 53 1/2", Depth 14". 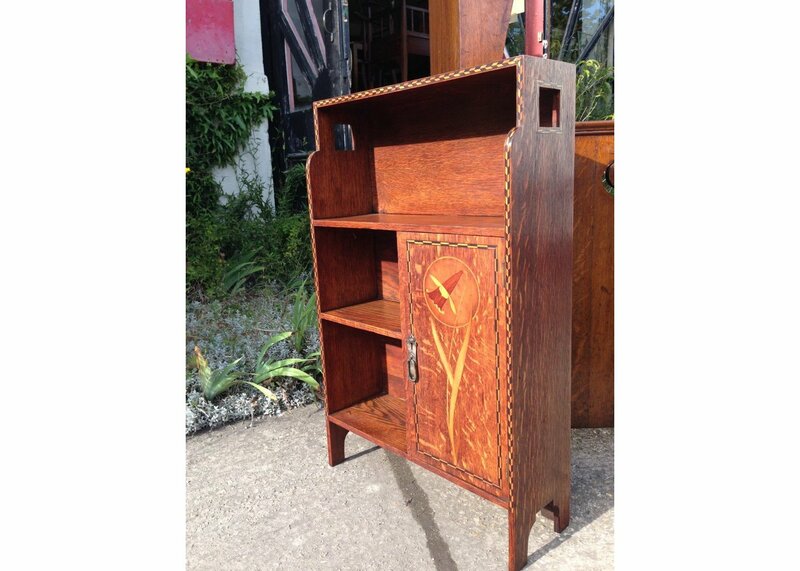 A good Arts and Crafts oak bookcase attributed to Shapland and Petter with wonderful stylised floral copper panels to the upper doors and conforming stylised hinges to the lower centre panel and an adjustable shelf to each of the lower openings. 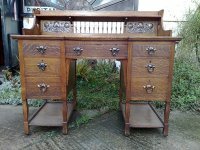 A good Arts and Crafts desk by Shapland and Petter with a pierced heart and shaped sides and back to the top, stylised floral stain glass back and a new leather writing area. A bow fronted drawer with stylised copper heart shaped handles and stylised fret work to the front legs with an elongated heart to the lower back spat. Height 43 1/2", Length 43", Depth to bow front 27 1/2". 1900. 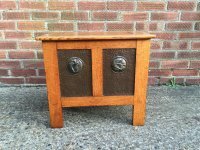 An oak Arts and Crafts hall/side table or small desk by Shapland and Petter with central drawer flanked by decorative roundels. A quality Shapland and Petter Hall robe with a turquoise blue Ruskin ceramic disc to the upper back plate, panelled doors opening to reveal lots of storage. A similar variation of this model below and would work very well together. Height 82 1/2", Width 42", Main Body Depth 15", top caps are 17" Deep. A quality Glasgow style Arts and Crafts oak Hall cupboard with display or hat area to the top, stylised carved details to the upper door panels, chocolate copper handles and copper strap hinges, and stylised floral carved panels to the upper doors, opening to reveal a fitted interior to the right hand door for keys, gloves and umbrella's with further hanging space inside. The first two images are of an identical hall cupboard with different hinges and handles, and the last five images are details of the one I have for sale and a true representation of the colour of this hall cupboard. Height 7', Depth of top 17", Width of top 45 1/2". An Arts and Crafts dressing table by Shapland and Petter with heart cut-outs below the shelf and the swivel bevelled mirror and to each side, with three large drawers and wonderful stylised copper handles and escutions. Height ", Width , Depth . An Arts and Crafts Walnut side table cabinet by Shapland and Petter with a subtle shaped top and original stylised floral glass panels and side shelves, with a row of shaped spindles to one side, twin shaped stretchers with a lovely elongated silver plated thistle escutcheon to the door. Height 30",Length 26", Depth 17". A top quality Arts and Crafts Oak Hallstand by Shapland and Petter with bevelled mirror flanked by a circular copper disc with hat and coat hooks, stylised cut-outs and stylised floral copper panel and glove box, the front sculptured uprights capped with sphere's and umbrella stands to each side with original drip trays. An Exceptional quality Arts and crafts mahogany sideboard by Shapland and Petter, the top shelf with shaped supports below, a Wonderful stylised floral copper panel to the back and stylised cut outs to the sides, top quality hinges and handles, two drawers with curved fronts. Circa 1900. For some reason most of the images have got a funny tinge to them the main sideboard picture 1, 6 and 7 are it's true colour. Height 64", Length 54", Depth 23". 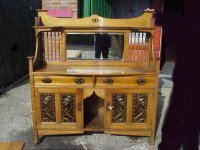 A top quality 1\4 sawn oak Arts and Crafts sideboard by Shapland and Petter, with stylised floral copper panels to each door 1 concealing a wine revolver, 2 serpentine shaped drawers with a gentle curving out detail to the work top, large bevelled mirror to the upper section flanked by square baluster shaped spindles, stylised cut-outs to the top, with top quality handles, stamped SandPB to the locks. Height 66", Width 61", Depth 20 1/2". 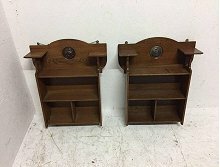 A pair of good quality Shapland and Petter Arts and Crafts oak wall/book shelves with a wonderful arched top and stylised floral copper roundels (each one different) to the centre flanked by a shelf perfect to display a pair of decorative vases with stylised cut-outs below and two lower shelves. Height 23" Width 28", Depth 6". 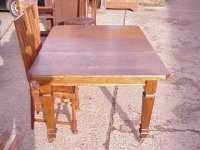 A good quality Arts and Crafts wind out, single leaf, oak extending dining table by Shapland and Petter. Length closed 41", Length with leaf 53 1/2", Width 41". Shapland & Petter of Barnstable. 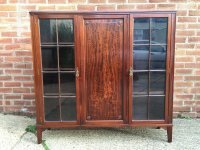 A super quality Edwardian walnut display cabinet, stamped S&P.B. to the locks. Height 48" , Width 47 1/2" , Depth 13". 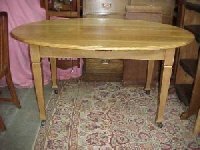 Oak Arts and Crafts oval dining table made by Shapland and Petter. Height 30 1/2", Length 60" Width 41". 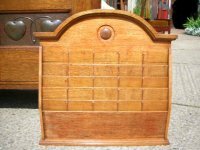 An oak Arts and Crafts letter rack attributed to Shapland and Petter. Height 24", Length 25", Depth at the bottom 4 1/2". Exceptional fall front desk by Shapland and Petter with cupboard to the top right the glazed door with wonderful copper stylised floral panel, an upper and lower bookshelves to it's left, a full size work surface which folds down to reveal leather writing area with pigeon holes to the back and full width drawer below with stylised copper handles flanked by hinged flaps, the sides with stylised floral cut-outs and central shelf with stylised detailing around the legs in wonderful original condition. Height 56", Depth 22", Width 26". Attributed to Shapland and Petter. 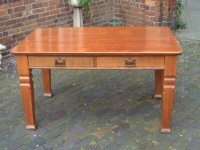 A very good quality Arts and Crafts oak two drawer desk of generous proportions with good quality Arts and Crafts handles with entwined drops. Height 30", Width 60", Depth 35 1/2". A rare Shapland and Petter Mahogany corner wot-not shaped spindles to the top and to each graduation shelf. Height 57 1/2", Width of bottom shelf from side front to back 15 1/2", Depth of bottom shelf from front middle to back 15". An Arts and Crafts oak fire surround by Shapland and Petter with flaring step back cornice and five stylised Heart shaped carvings to the top flanked by tapering columns with large open and central circular detail with small square supports and lower shaped shelf with twin fluted arched brackets to each side and conforming twin fluted legs. Height 78", Width of cornice 65 3/4", Depth of cornice 9 3/4", fire opening opening 37 1/2" x 37 1/2". Circa 1895. NOTE. The measurements of the opening are normaly standard sizes and if one required a shorter or less wider opening then we would add an 'oak infill to the opening to make the perfect size with perfect matching oak, this is exactly how they were fitted originally because inserts were often different sizes. Shapland and Petter. 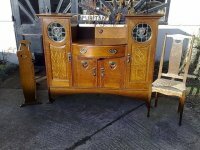 An Arts and Crafts oak sideboard in the Glasgow Style made by SandP using the best 1/4 sawn oak giving that wonderful grain figuring, with a purple enamel heart to the top back with subtle carved detail surrounding it and an open serving area in front and a large bow fronted drawer with a cupboard below and further Purple and Green stylised floral enamels again with sculptural carved floral details surrounding them, the central section flanked by a pair of tall cupboards with wonderful stylised Glasgow Roses in circular stain glass panels. The sweeping arched detail to the lower front uniting the front legs with curved details to the lower sides all on moulded flat oblong feet. This is one of the very best Shapland and Petter sideboards I have ever come across. Last image from The Studio. Height 51 1/2", Width 64 1/2", Depth 23 1/2" at the centre of the drawer. A Stunning Shapland and Petter Arts and Crafts oak desk with an upper shelf with shaped finials below flanked by wonderful stylised floral copper panels and pierced hearts to each side, the Green leathered work area with very functional side slides and a bow fronted centre drawer flanked by a further bank of 3 drawers to each side with wonderful stylised copper handles and shaped legs with lower open shelves below. Height 40" Width 48", Width with both flaps out 72 1/2", Depth 25 1/2". Circa 1900. A Superior quality display cabinet by Shapland and Petter of Barnstaple, with superb stylised floral inlay's to the centre top and lower front left and right and to the lower sides, stylised shaped spindles to the top shelf with capped tops in the manner of Voysey, open display to the centre and top and bottom shelves and two shelves behind the glazed doors it will display an array of decorative items with a special little shelf at the crown to display a special piece. Superb quality stylised handles. SandP supplied Liberty and Co with the top end inlaid pieces of the highest quality in design and manufacture. Shapland and Petter. wall cabinet by Shapland and Petter with Golfing panel and copper strap hinges. A Shapland and Petter Arts and Crafts Oak Grandfather clock of superior quality with stylised floral carving just below the flaring cornice, a silvered dial with engraved details depicting a cottage scene with a windmill, a castle and man rowing a boat on a lake all set in a valley with a second hand dial to the inner top and cornered with decorative Gilt Angelic heads entwined in foliage flanked by fluted pillars, the central door carved with a single stylised flower of pure design and copper strap hinges with enamelled ying yang's and enamelled ovals to each end and the sweetest enamelled escution with stylised floral details, the lower section with a Walnut panel to the centre and standing on flaring square feet with arched detail. 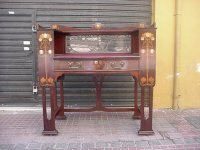 A fantastic Mahogany desk by Shapland and Petter inlaid with stylised flowers of various fruit woods, Abolone and Mother of Pearl. The shaped top with fabulous stained glass panel below, a generous writing area with bow fronted drawer and bookshelves to the sides. The plank legs with elongated cut-outs united by stretchers and central vertical support to the back, with copper swan neck handles with heart shaped back plates. Height 41", Width 44 ", Depth 20 1/2". Circa 1900. An Arts and Crafts small bookcase attributed to Shapland and Petter with stylised floral cut-outs to the sides flanked by the sweetest little lift up flaps. Height 38", Width 17", Width with flaps up 26 1/2", Depth 9". Circa 1900. A Shapland and Petter mahogany hexagonal sidetable with herringbone inlay to the top and six legs united by lower shelf and floor stretchers, illustrated in the SandP catologue C1903. Height 25 1/2", width corner to corner 24", Depth flat to flat 21". Shapland & Petter of Barnstable. A rare Arts & Crafts trunk with stylised copper panels depicting mythical birds, illustrated in the S&P catalogues. A rare Arts and Crafts oak canterbury by Shapland and Petter with upper extending square cap supports and half moon stylised cut-outs to each side with shaped segmented paper racks. The square shaped legs united by a lower shelf with sweeping shaped aprons below terminating on spade feet. Height 27" Depth 13" Width 18". Circa 1900. A rare Shapland and Petter Peacock folding screen with Abalone, Mother of Pearl and fruitwood inlays. Height 37", Width open fully 36". Circa 1900. A good quality Arts and Crafts oak hallrobe and matching hallseat with stylised copper motto 'PORT AFTER STORMY SEAS' to the robe and a stylised copper ship to the top of the seat with stylised heart cut-outs above. These were made to go side by side or to be used separately which you can see in the original drawings held in the National Design Records. Hall seat: Height 73" x Width 30" x Depth 18". H 185cm x W 77cm x D 46 cm. Hall Robe: Height 78" x Width 24" x Depth 18". H 199cm x W 61cm x D 46 cm. A plant stand with repousse copper heart detailed panels by Shapland and Petter, one sold one in stock. 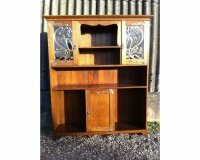 A fine Arts and Crafts bureau bookcase by Shapland and Petter with display area to the top and precisely carved stylised floral details with open shelves below, the pull down writing area with pigeon hole storage and central mirror to the back. 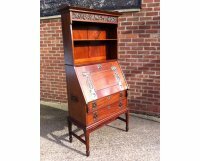 The front with stunning copper and gilt stylised floral handles and hinges and smaller ones to the pull out side rests for the writing area and wonderful conforming lifting handles to the sides, with two lower drawers and square tapering legs united by a H stretcher. 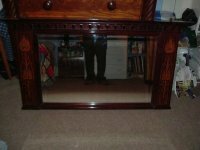 A super quality piece throughout typical of SandP in wonderful original condition. Height 75 3/4" Width 37 1/2", Depth 17 3/4". Circa 1900. A good Arts and Crafts hallstand by Shapland and Petter with a flaring cornice with shaped supports and a Motto to the top in copper which reads :- ''FAIR WEATHER AFTER YOU'' centred by a circular aneroid barometer with a bevelled central mirror and shelf below, flanked by stylised brass coat and hat hooks, it has a central key and glove drawer which has a semi-circular front with red veined marble top and shaped details above, with umbrella and stickstands to each side with original drip trays to the base and a shaped lower apron the whole on square shaped feet. Height 84" Width of cornice 53", Depth of cornice 13 1/2". Circa 1900. An Arts and Crafts oak bookcase by Shapland and Petter of superior quality with flaring cornice and good stylised floral work to the stain glass doors with impressive copper elongated vertical strap hinges to the lower panelled doors and conforming stylised copper handles. The whole stood on square pad feet with shaped brackets above and shaped details to the lower sides. Height 86", Width of cornice 46 1/2", Depth of base 18 1/2".Circa 1900. A stunning Shapland and Petter Arts and Crafts oak Hall Cupboard with an upper area for display with a 3/4 gallery with moulded top rail and heart cut-outs to each shaped slat, just below is a flaring cornice and 3 fabulous copper hinges and 2 stylised floral panels to the upper panels and Heart and circular details to the lower copper panel of the door, flanked by scribed details with heart cut-outs to the front lower legs. There are 2 stylised coat hooks to each side with shelves below and walking stick rails below those. The door opens to reveal full width glove and key box to the door with lift up lid and the interior has an upper shelf with hanging space below and room shoes at the base. Height 84", Depth of cornice 19", Width of cornice 43". Circa 1900. 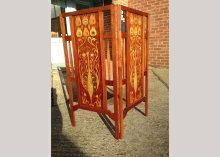 A Shapland and Petter oak Arts and Crafts stick stand with stylised floral copper panel to the top and copper panel with roundels to the bottom original patina and original drip tray. illustrated on page 364 of Pictorial Dictionary of British 19th Century Furniture Design. Retailed by Norman and Stacey. Stamped. Height 41" 102cm, Width 22 1/2" 53cm, Depth 10" 27cm. Circa 1910. A Shapland and Petter oak hexagonal sidetable with herringbone inlay to the top and six legs united by lower shelf and floor stretchers, illustrated in the SandP catologue. Height 25 1/2", width corner to corner 24", Depth flat to flat 21". C1903. A Shapland and Petter Oak hallstand with dentil moulding to the top and inlaid with stylised floral details, a single draw below with a superb quality stylised floral brass handle and line inlay to the draw and lower arch with turned front legs and wavy back legs capped at the tops, the walking stick aperture with stylised cut-outs to the front and subtle carved details to the backs with it's original drip trays with canted corners below. Height 39", Width at the back 33",Width at front 36", Depth 13". Circa 1900. Height 40”, Width 28”, Depth 6”.